For her, the varied tones of the rubber parallels human diversity, while the tire treads suggest images as varied as African scarification and textile designs. The visible wear and tear on the tires evokes the physical marks of human aging. Equally, Booker’s use of discarded tires references industrialization, consumer culture, and environmental concerns. Booker’s artistic process is enormously physical, from transporting the tires to reshaping them with machinery. 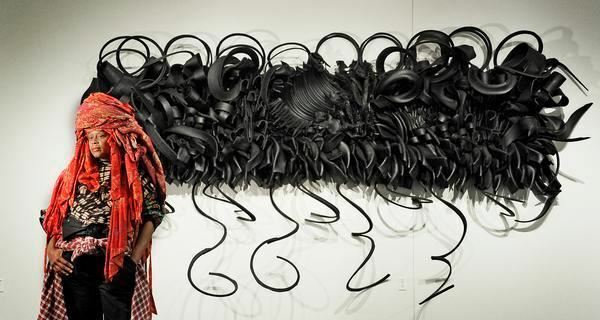 Though she has adopted utilitarian jeans and work boots in her studio, she always wears a large, intricately wrapped headdress, which has links to her earliest wearable art and has become her fashion signature.